The night brought no respite. Mortars. Rockets. Nearly one hundred Japanese soldiers, alone or in small groups, who crept up to American foxholes to throw a grenade, slash with a saber, or thrust with a bayonet. The Marines of 1/24 knew that daylight meant another advance, but by 0443 they were so sick of fighting infiltrators that they welcomed the dawn, attack orders or no. The end result of most infiltration attempts. Photographer Joe Rosenthal captured this image. King Hour was set for 0810, with the ambitious objective of taking the O-2 line. The assault companies of 1/24—Able and Baker—were assured of supporting artillery and naval fire from 0750 to 0830, and concentrated air support until 0850. Baker Company received this news with derision, recalling the American planes, ships, and guns that mistakenly blasted them on the previous day. A last-minute delaying order bought the infantry a respite until 0930, but since nobody told the artillery, the bombardment went ahead on schedule. 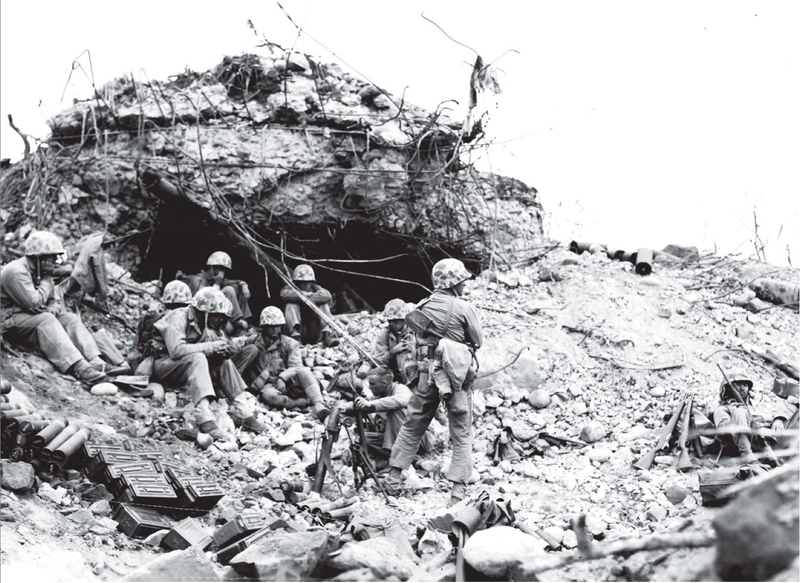 The gunners of 1/14th Marines fired nearly 1,500 rounds into the hills and crevices, saturating the area with high explosives and shrapnel – and thoroughly alerting the Japanese, who simply waited below ground for the storm to pass. By the time the assault troops (Able and Baker companies, plus RCT 25) got started, any element of shock or surprise was long gone. The artillerymen could only guess at the effectiveness of their fire; the infanty would soon find out firsthand. A 105mm howitzer of F/2/14th Marines. This gun began firing support missions on D+1. Major William K. Stewart’s company anchored the right flank of the invasion force. To their left, other Marines were attempting to swing the entire line across the island to the north, making Able Company the pivot point. Instead of a general advance, they were to continue the mission of the previous day, moving slowly along the beach. Gaining ground and killing Japanese were of secondary importance to keeping contact with the units on their left. The Able Company marine who set his jaw, squared his helmet, and climbed out of his foxhole at 0930 was very different than the one who landed on the beaches some 36 hours ago. He was familiar with the sights and sounds of sudden death and catastrophic injury; he was a rare man indeed if he was not worried for or mourning the loss of at least one friend. He faced more of the same blockhouses, pillboxes, firing ports and reinforced foxholes he’d faced the day before; each new defensive position presenting a new and unique challenge to his squad, platoon, and company as they worked out how to eliminate each one on the fly. Fortunately, reinforcements were on hand to help deal with the situation. 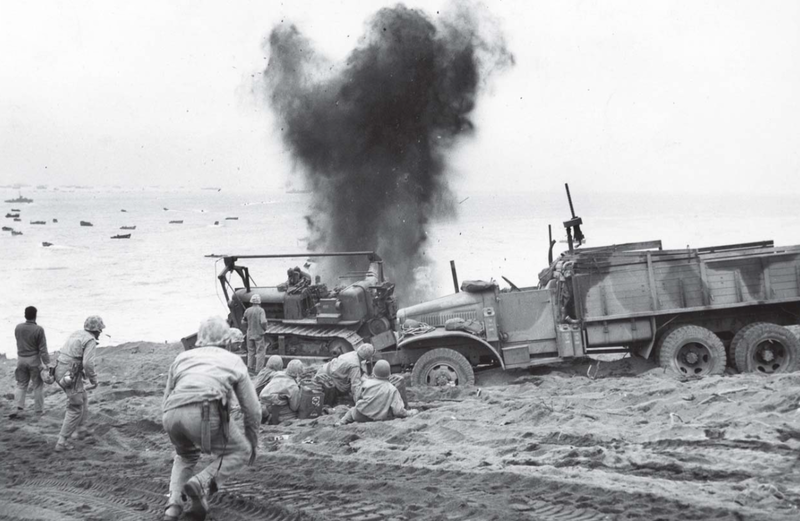 A platoon from the 4th Engineer Battalion was attached to the battalion, and for this assault the combat engineers would move up along the beaches with the riflemen. Even better, Company B of the 4th Tank Battalion was rumbling up in support, and their 75mm main guns tracked targets along the cliffs. In this still from a USMC combat film, riflemen make their cautious way across Iwo Jima. The shot was taken from inside a tank. Scarcely 100 yards into the advance, sharp-eyed Marines spotted the distinctive horns of a Japanese anti-boat mine. These powerful explosives could tear the guts out of a Sherman tank or flip an amphibious tractor onto its back. Even a near miss could cause a tank to throw a tread, rendering it immobile and an easy target for mortars, antitank guns, or suicide squads. Brave groups of Able Company men accompanied the engineers to one mine after another, while the tankers kept up a covering fire. A total of 35 mines were gingerly removed from the area, and safe passages were marked off with white tape. Meanwhile, demolitions teams kept up their grim work of eliminating caves and pillboxes. 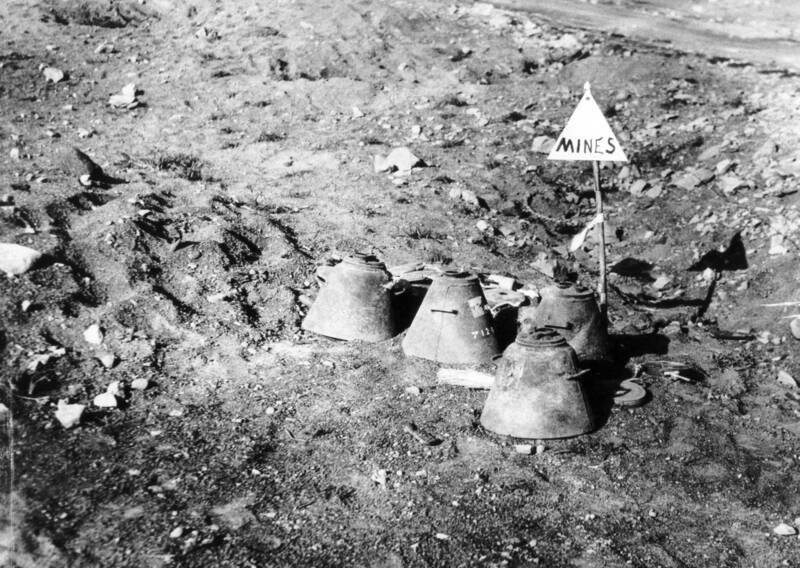 A selection of Japanese mines found on Iwo Jima. USMC photo. Company A “moved along the beach as far as the terrain would permit,” under increasingly heavy fire. While their advance was far from speedy, it was enough to outpace the unit on their left; when orders came to halt and consolidate, they were chagrined to learn they had gone too far. With great regret and no small amount of foul language, Company A retraced their steps and dug in for the night in TA 166E. They were less than 100 yards from where they’d started that morning. The drastically reduced casualty rate was a point of consolation. With their newfound experience with the peculiar Boat Basin terrain – and with engineers and tanks to share the risk – Able Company got through the day all but unscathed. PFC Alfred Dennis had a close call with a shell fragment that caught him on the jaw; he would return to duty in a few days, sporting a new scar and a genuine war story. PFC Joe Locke was treated by a corpsman, but stayed with the company. If a combat correspondent were to wander into the four blockhouses atop the ridge overlooking the Quarry on D+2, he would have met a company of Marines with strong opinions regarding the battle’s progress. And should he ask an ignorant question about where they’d rather be (as some correspondents were wont to do), he would have gained a notebook full of quotations, very few of which would have passed the censor. Rifleman Roland Jackson was too old for this kind of adventure. He was thirty-two, almost. An old man, drafted away from his wife Josephine and their home on West Cleveland Avenue in Newark, Delaware. He was smart, too, college educated, with a good office job. As he gripped his Garand on Iwo Jima, he might have realized that it was one year to the day since he joined the Marines. It was the longest year of his life. PFC Gilbert Miller could dream up the faces of his brothers and sisters in less time than it took to recite “William, Elmer, Harry, Clarence, Nellie, Cora, John, Ralph, Robert, James, Carl, Opal, Hazel.” Doing so could distract him from worrying about his four best buddies. The last he knew, Corporal Robert “Ernie” Watkins was stateside in engineer school – dangerous training, but safe enough. PFC Ed Curylo was scouting for the battalion intelligence officer and rarely had time to visit. And Corporal Donald Rau was carried off, dazed and bloody, during the previous day’s attack. First Squad, Third Platoon was dwindling fast, and Miller likely hoped for the mythical “million-dollar wound” that would send him home to Jasper, Indiana. His twenty-first birthday was coming up in March; he doubted he’d be back by then, but maybe he’d celebrate twenty-two surrounded by siblings. Miller, Watkins, Curylo and Rau, 1944. Memories of home were much closer for a pair of Baker Company machine gunners. PFC Alex Klinkoski could simply turn around and see a familiar face looking back – his twin brother, PFC Frank Klinkoski. The nineteen year old Ohioans had enlisted on the same day (their service numbers were sequential: 969224 and 969225) and, in defiance of the odds and military logic, wound up in the same boot camp platoon. Then the same replacement draft. And then the same regiment, company, and platoon. They even pinned on their PFC stripes on the same October day. Alex and Frank were, quite literally, inseparable. Second Lieutenant Homer English was nervous. He was new to command, having inherited Baker Company’s Second Platoon from the popular First Lieutenant David Lownds in early December. English could lean on a pair of combat veterans for guidance: his second-in-command, Gunnery Sergeant Albert Estergall was a decorated veteran of three earlier campaigns, and his messenger PFC Ardith W. Gilbreath was a former BARman who had fought on Saipan. Still, the lieutenant felt the weight of his responsibility – it was slammed home the previous day, when PFC Gilbreath was evacuated with a gunshot wound in his throat. Now, the lieutenant fiddled with his wedding band and waited for the appointed time, wishing he was home with his new wife. And so it went down the line. Gunnery Sergeant Thomas Mackey wished for his old post as orderly to the Assistant Secretary of the Navy (AIR). Corporal David Colbert remembered fighting the Japanese from the deck of the USS Lexington and hoped that Iwo Jima would not be as bad as the Coral Sea. Corporal James Naurot was leading a machine gun squad for the first time, and just wanted to do his job well. Private Matthew Redling thought back over his recent history: sweating out rehearsals for Belle of Barcelona with the Saint Michael’s High School Glee Club two years ago; sweating out his first week of boot camp one year ago; and now sweating out his second morning in combat. Of all the places in the world they could be, the Marines of Baker Company would rank sitting in the blackened, reeking blockhouses as second to last. The only place less appealing was outside those same blockhouses, making another advance into the Japanese lines. Which was precisely where they were headed on D+2. By midafternoon, it was clear that Baker Company could take no more. A welcome warning order came down to prepare for relief by Company C; this potentially tricky maneuver was completed by 1600, and Company B passed gratefully into battalion reserve. They returned to the welcome sight of their blockhouses—now sufficiently “rear area” enough to count as a reserve position and supply staging area—and, in Marine parlance, “crapped out” in numb exhaustion. A mortar squad attempts to relax, while riflemen rest to the right. Their blockhouses have become an ammunition supply point. Official USMC Photo. Twenty-five men from Baker Company did not return to the blockhouses that night. Lieutenant English was carried away, his legs full of shrapnel, his combat career over. Gunny Mackey was evacuated. The Klinkoski twins were both wounded, but here their paths diverged: Alex, slightly wounded, stayed with the company, while Frank was evacuated. Colbert, Naurot, and Redling were aboard hospital ships, all with multiple shell fragments embedded in their bodies. Assistant Cook Dave Gonzales was gone; a grenade fragment sliced his left eyelid, sparing him blindness by a hair’s breadth. PFC Joseph A. Martel was gone and nobody knew where; two months later it was discovered that he’d died of his wounds aboard an LST. And Roland Jackson and Gilbert Miller lay dead under bloody ponchos. There was no cemetery yet—there was no time, or space, or detail available to make one—so the dead were simply laid out in neat rows, or stacked like cordwood, in ever increasing numbers. It was time for Major William Esterline’s company to get into the fight. 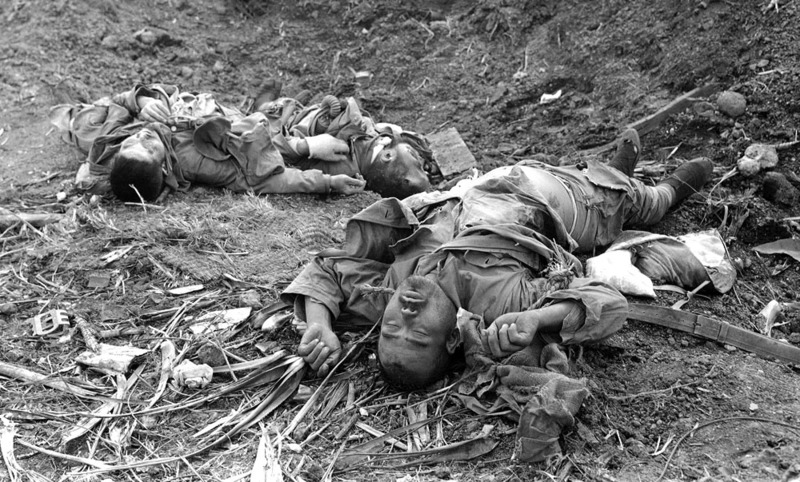 One platoon, alerted earlier than the rest, was fed into the line between Baker Company’s right and Able Company’s left; they spent most of the morning “working over a cliff area” and maintaining contact between the two assault companies. By 1500, orders to saddle up and relieve Baker Company were received, and within the hour Charlie Company occupied a few hundred yards of hard-won Iwo Jima real estate. Charlie Company quickly learned to assume the worst and take every precaution. Although they pushed no farther ahead that day—the cutoff time for consolidating positions was 1700 hours—they still encountered point-blank gunfire, grenades, and the ever-present mortars. PFC Joe “Smokie” Borges, a twenty-year-old rancher from rural California, caught a mortar round in his chest that killed him instantly; he was the company’s first combat fatality of the battle. The limp form of Corporal Raymond McAdoo was carried to the rear; he would die the next morning and be buried at sea. Evacuating casualties under fire. Official USMC photo. If a wounded Marine reached a hospital ship, his chances of survival improved exponentially. His chances improved if he made it to a base hospital, and and if he was sent back to Hawaii, he was almost certain to live. However, almost certain is not absolutely certain. PFC Richard Russell Rusher, a Charlie Company machine gunner, was struck in the head by shrapnel on February 21, 1945. 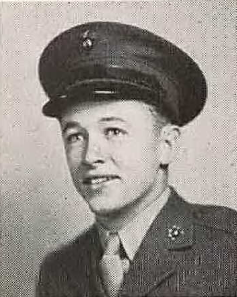 He received first aid in his foxhole before being carried back to the battalion aid station, where Doc Porter and Doc Lyon worked to stabilize the young Marine for the trip back to the beach. 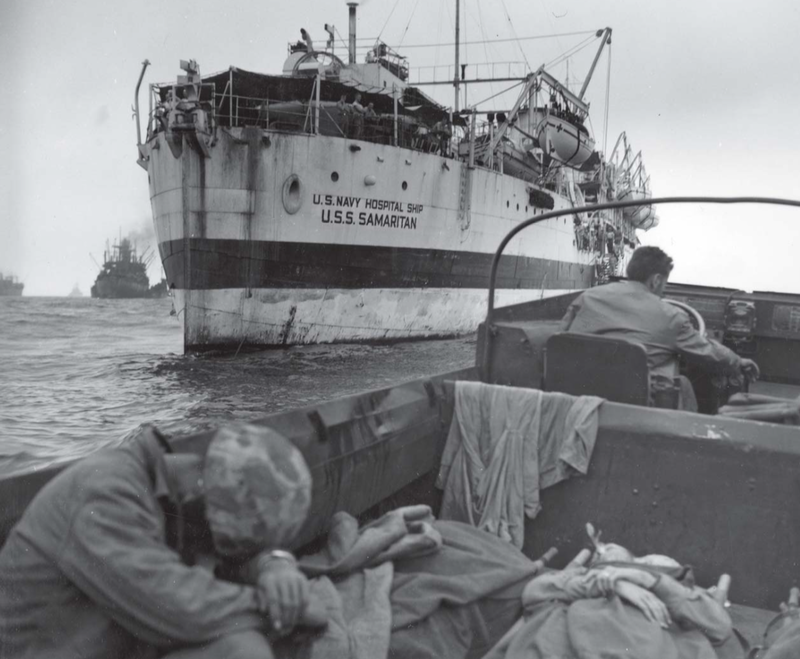 From the beach, Rusher was carried onto a landing craft, boated to the hospital ship USS Samaritan, and was put under 24-hour observation—like McAdoo, his diagnosis was a compound skull fracture. Within days, Rusher he was at the 148th General Hospital on Saipan; one week after being wounded, he was on a flight bound for Oahu. He wrote to his family that he was not seriously wounded, and hoped soon to be home in York, Pennsylvania. And yet, in the end, it was not enough. 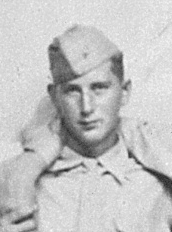 Richard Rusher died of complications from his Iwo Jima wound on March 19, 1945—one day after Charlie Company’s 31 survivors left the island for good. Battalion HQ reinforced its position of the day before, and kept up its hum of activity. Lieutenants Murray Fox and Steve Opalenik kept their 81mm mortars firing in support of the day’s advances. They were already compiling notes on the effectiveness of the weapons: the heavy HE rounds had accuracy issues, and there weren’t enough of the lighter ones to supply the demand for fire missions. Fox in particular was beginning to question the effectiveness of the 81mm itself. The smaller 60mm mortars were more portable, required fewer men to transport, were less conspicuous to deploy, and in an operation like Iwo Jima could do the exact same job as the bigger gun. Furthermore, he doubted that the seven-pound 81mm projectile had the power to dent the Japanese defenses. Fox made a mental note to recommend a heavier mortar when he got the chance. 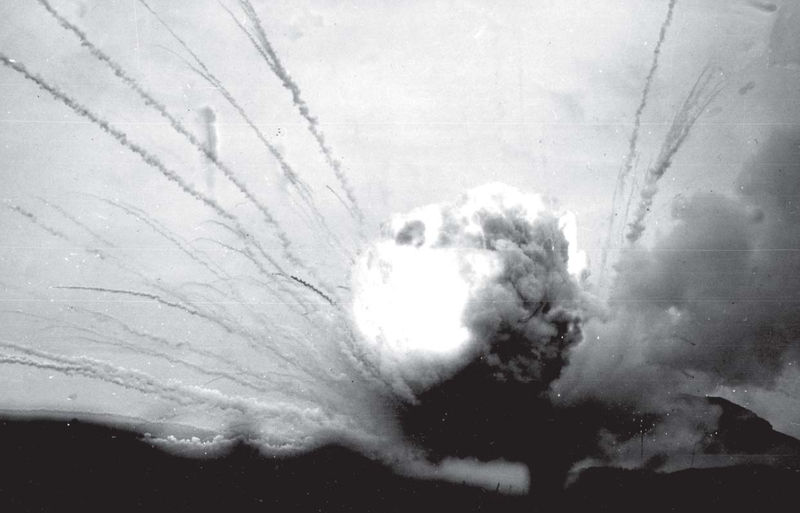 An ammunition dump explodes in the 25th Marines’ sector. This was reportedly taken at 0400 on D+1 – multiple such incidents resulted in a severe shortage indeed. Official USMC photo. A near miss sends this Marine working party scurrying for cover. Official USMC photo. Once again, it was a sleepless night. Japanese infiltrators were out in force; occasional flurries of exploding grenades accompanied yells of fury, grunts of exertion and wails of pain as Marines in foxhole pairs or trios fought the intruders. “The tension from the unknown of such nights was wearing and a strain,” wrote Captain Stott in a typical understatement. The Fourth Marine Division, “reduced by heavy casualties and battle fatigue,” was operating at 68% efficiency. None of its unit had advanced farther than 500 yards since D-Day. Able PFC Alfred D. Dennis, Jr.
PFC Robert E. Bales, Jr. Even with precautions, B/4th Tanks lost four machines on this date, two to 47mm antitank fire and two to thrown treads. 4th Tanks report, 5. Major Charles L. Banks, “Final Report on IWO JIMA Operation, Battalion Landing Team 1/24,” in Annex George to Fourth Marine Division Report on Iwo Jima: RCT 24 Report (20 April, 1945), 121. Hereafter “Final Report.”. 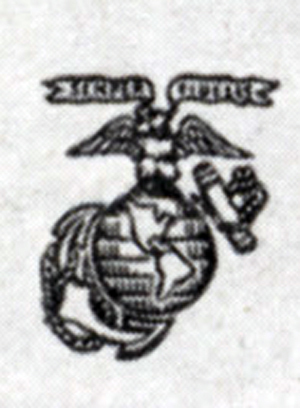 The Final Report has a wildly different assessment, stating “The company had 7 killed in action and 10 wounded and evacuated this date.” The casualty rate reported in this article is based on original copies of the 1/24 muster roll, cross-checked against the Marine Corps casualty database. It is not known where the Final Report’s figures come from. [6.1] Charles Brown and Alfred Eskildsen, oral history interview conducted by Ed Sutkowski, “Interesting People with Ed Sutkowski, Episode #404 – Chuck Brown and Al Eskildsen,” February 26, 2009. In this interview, both Eskildsen and Brown are adamant that they were hit by friendly fire, and reference the air and naval strike of D+1. However, all available Marine Corps records indicate that the pair were hit and evacuated on D+2. Their claim of friendly fire, though, is likely true: short rounds occurred in almost every bombardment. Roland Jackson was buried five days later, in Plot 1, Row 4, Grave 177 of the Fourth Marine Division Cemetery. Gilbert Miller had to wait a full week for burial in Plot 1, Row 8, Grave 361. Fox did just this in the battalion’s After Action Report, requesting to reequip his section with “a 4.2 mortar or a 155mm mortar” and recommended dropping the 81mm weapon entirely.